Pineapple Cream Cake which I first posted back in December of 2008 is worth posting again. It's quick to make, is light and delicious and keeps well in the fridge for a day or two. 1 angel food cake made either from scratch or a mix. In a large bowl, mix undrained crushed pineapple with the powdered Vanilla instant pudding. Mix until well blended. Set aside. Whip cream in another bowl until stiff. 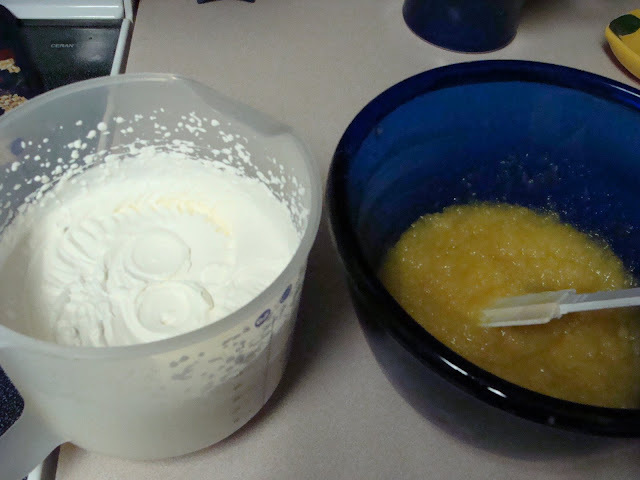 Gently fold whipped cream into pineapple mixture until well blended. Slice cake into 2 or 3 layers. Spread a generous amount of pineapple cream between the cake layers and then ice cake with the remainder. Looks delicious! Looking forward to all the great dinners! This cake looks great...blurry or not! Grin...actually, your picture looks fine and this recipe is sure to be a winner for those who don't have all the time after a HUGE festive dinner this season. Thanks for the post. I have a suspicion that there are more than several people who read this who love that pineapple addition to desserts! My mouth is watering! This sounds good and looks amazing! A+ for presentation! This does look yummy...but I again I have questions. Do you drain the pineapple before mixing it with the pudding and do you mix the pudding and pineapple together to make a pudding like consistency...?? Or does the pudding and pineapple remain like it looks in the bowl and then add to the whip cream, does this not make the icing a more "runny" texture..?? YUM! I've never made it with the whipped cream mixed into the pineapple pudding mixture. I've always mixed in cool whip. I'm certain the whipped cream is much better. I usually add fresh berries and use lemon pudding. Bev, This looks great...but how does the icing hold up if it isn't eaten right away? I find that sometimes whipped cream mixed with other things sometimes separates or goes watery when it sits for any length of time. Found this out the hard way when I made a Banoffee pie and topped with the whipped cream too soon and the whole thing went watery. Janina, I've never had any trouble with this separating or going watery. I've kept the leftover cake to serve another day several times and the topping is just as good. I usually put it in a cake keeper or some kind of plastic storage container. I'm thinking because it is mixed with the pineapple/pudding mixture, it is somewhat stabilized. Janina, I always use stabilizer for my whipping cream recipes. (Dr. Oetker Sahnesteif or Whip cream stabilizer.) It takes the worry away about the whipping cream going watery. Give that a try. That's a product that is always in my pantry. You can take a look at this product. Thank you Bev and Marg! My grandmother made a cake very similar to this. I have sent the link to my brother as this was the cake he requested for his birthday every year. Thank you for the lovely memories it brought back! Aww - this cake brings back memories. It sounds absolutely delicious and looks wonderful!